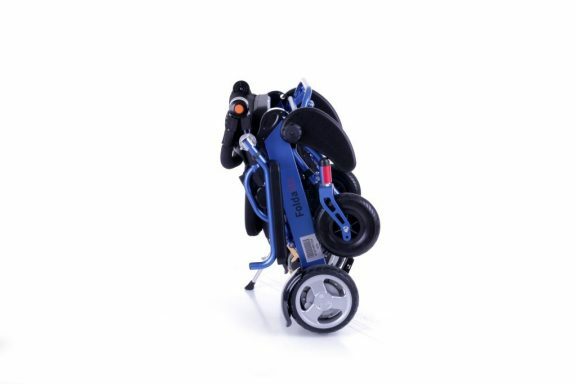 The Foldalite Pro is a small class 2 Folding Powered Wheelchair, manufactured by Motion Healthcare. Sophisticated suspension system, larger frame and increased weight-bearing capabilities for unbeatable comfort even on long distance journeys. User-friendly control panel and dedicated brushless motors deliver a perfect combination for indoor control and outdoor performance. Folds into a compact package to make for trouble-free transportation and simple storage, without complex instructions or the need for tools. 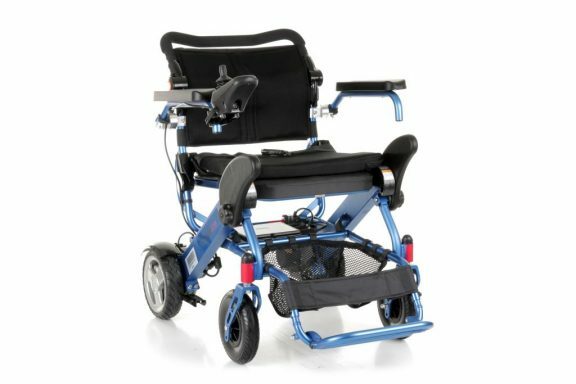 The Foldalite Pro incorporates a sophisticated suspension system to absorb the impact of travelling over rough and uneven terrain. By dampening the friction between the tyres and the ground, harmful vibrations are prevented from travelling through the frame of the powerchair and into the user’s body. Long journeys outdoors will never be a chore. 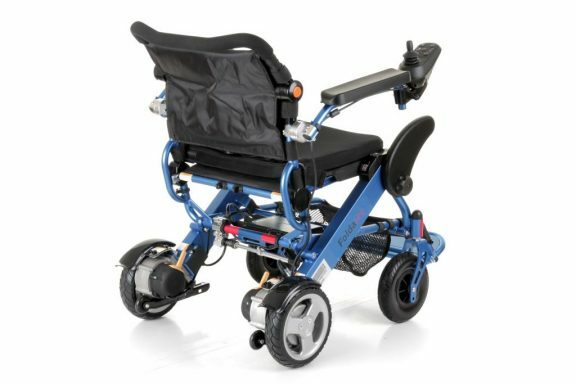 The Foldalite Pro’s durable suspension system does not compromise any of the powerchair’s manoeuvrability, instead offering greater stability and control over troublesome terrain. The Foldalite Pro imitates the clever and convenient design of the Foldalite. Fold it into a compact, manageable package in less than a minute for easy transportation and storage even when space is limited. The Foldalite Pro leaves no protruding parts in its folded state, reducing the risk of damage. 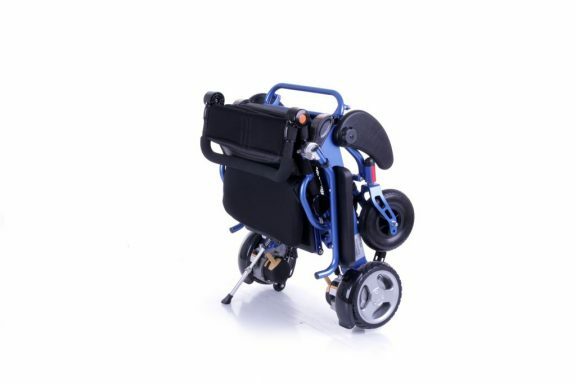 The wider frame of the Foldalite Pro offers a little extra comfort and load-bearing capacity without increasing the weight, so you can still easily lift and carry the powerchair. The Foldalite Pro features a remarkably user-friendly control panel, capable of being fitted to either armrest depending on the user’s preference. Just 4 buttons control the power settings and speed of the powerchair, with a highly responsive joystick to control direction. 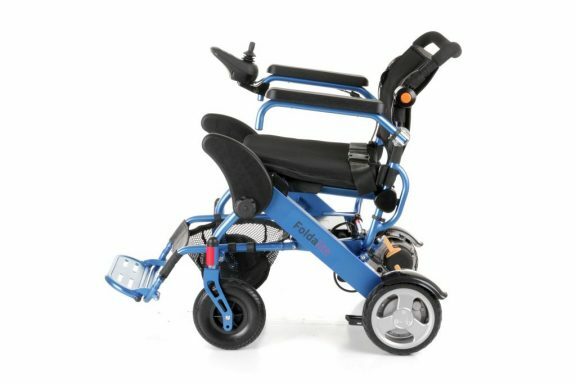 As a rear-wheel drive powerchair the Foldalite Pro is agile and easy to manoeuvre, with anti-tip wheels for extra reassurance and two solid front castor wheels for stability. To enquire about buying a powerchair or having a demonstration, please call us on 01332 863742.